In the tumultuous year of 1969, Canadian queers suddenly found themselves in a new legal landscape. The bill that decriminalized homosexuality passed the parliamentary vote in May – in August, that bill was voted into law. No one was quite sure what it would mean as far as day-to-day life for gays and lesbians, but some forward-thinking folks in Edmonton decided that with this new legal reality, it was time to create Edmonton’s first official queer gathering place. They chose the name Club 70, even though it was autumn of 1969. Not only was 1969 almost over, but a few of them felt that naming it Club 69 was just a bit too cheeky. And so they heralded the approaching decade by naming the bar with an eye to a new future. The location was on 101 street and 106 avenue, in the basement of a building that still stands today. Back then, a Greek restaurant occupied the main floor. Even though the Milla Pub is still open, the building is grubby and the yellowing plaster shows neglect. But if you look at the north end of the building, there is a brightly painted door that leads to the basement. It was behind that door that a queer person would nervously descend down the stairs into the very beginnings of Edmonton’s very first official gay club. You may know it now as the seedy Milla Pub. But behind these doors in 1969, a queer person would nervously descend down the stairs into the very beginnings of Edmonton’s very first official gay club, Club 70. There had always been places where the Friends of Dorothy could discretely congregate – generally in one corner of the taverns that occupied the main floor of the large, grand hotels that dominated downtown: The Mayfair, The Corona, The Royal George, and the King Edward (or King Eddie). But these gay hangouts were never official – they just sprung up out of necessity in cities across Canada. It was in these early unofficial gathering places that ‘the community’ began to recognize each other in the smoky half-light, and began to connect and communicate. Even as recently as the early 80s, a gay man could stroll into one of these smoky taverns, and once his eyes adjusted to the darkness, he could find a group of men like him, taking over one corner or certain tables in the room. None of these hotels stand today – they’ve been replaced by downtown malls, or newer high-rises. Only the Corona LRT station keeps one of those names alive. But somehow the early gay club scene’s first legal footprint has escaped the wrecking ball of progress. Through those nondescript doors, one descended down a flight of stairs into a space no bigger than a large living room. Everyone had to sign in, although pseudonyms were the norm – people were still very afraid to be ‘outed’ and the last thing one would want was to be identified by logging into a register of a gay bar. There was hired security – a straight man who kept a scowling presence at the bottom of the stairs. The club had no liquor license, and so bringing your own bottle was essential, as the concession only sold pop and chips. There was a small dance floor, and even a tiny stage populated by the pioneers of Edmonton’s burgeoning drag scene: Grindl performed on that stage, as did Trixie, and Millie – names that, within a few years, would become legend on the stages of the underground. Few Queens were as legendary as Millie, who in 1976 would become Edmonton’s first crowned head of state, the unofficial Godmother to all Queens who followed: Empress I of Edmonton, establishing the Imperial House of Millicent, the first in a long chapter of royal houses that still rules Edmonton through the auspices of the Imperial Sovereign Court of the Wild Rose; she was simultaneously crowned Mz. Flashback I. Millie has the distinction of being the only drag queen in Edmonton’s history who wore both crowns at the same time. The tiny club could only hold about 50 people, and was only open on Friday and Saturday nights. The ambiance was more like a house party than a nightclub. But it was the first queer space. That meant safety. It meant being able to freely recognize and acknowledge people like yourself, to dance with whoever you wanted to dance with, or to freely cheer on a drag show. That freedom was fiercely protected, however. Club 70 had a strict gay-only membership policy, for the safety and discretion of its members. Violating this policy by bringing a straight person to the bar would get you a 30-day suspension. However, it got off to a very rocky start. The location was short-lived, even though Club 70 was not. After a month of weekends of business, the owner of the building finally realized what sort of business had taken root in his basement, and when staff and members arrived for the weekend party, they found he had nailed the doors shut, seized the liquor, and whatever there was in the way of a sound system. The fledgling gay club was suddenly in a legal battle with a landlord. However, they won that battle, as their lease had been broken illegally, and were able to not only get their stuff back, but the owner of the building was forced to pay for their relocation costs. Club 70 closed for a month, eventually finding a new home on 106 street; that building remained queer for the next 42 years. When Club 70 had run its course, it transformed into The Cha Cha Palace for a short period in 1978, then Boots & Saddles for decades, and lastly The Junction Bar & Grill. Once the 106 street location opened, that spot in Edmonton was a safe queer space from 1970-2012. In 1969, the first step towards building a new sense of community was building a home; a meeting place or a town square, where LGBTQI people could gather, and for the first time, discover who they were in this brave but unknown new world. Written by: Darrin Hagen, legendary playwright, actor, sound designer, composer, performer, director and TV host based in Edmonton. Part I of The Lure of Gold in Alberta’s History can be read here. Figure 1. A storefront in Edmonton advertising supplies for prospectors (image B4424 reproduced with permission from the Provincial Archives of Alberta). Gold! It was dreams of golden wealth and the promise of adventure that drew thousands of young men west to California and British Columbia in the 1800s. Although never achieving the spectacular wealth in gold of its neighbors to the west, Alberta witnessed its own gold rush in the 1860s, and over the subsequent decades many people passed through the province on their way to other mining frenzies that swept across the northwest. Many prospectors settled in the province and became leading members of Alberta’s burgeoning communities. Tomorrow is Aboriginal Veterans Day. It is estimated that more than 12,000 First Nations members, Inuit, and Métis served in WWI, WWII and the Korean War. I’ll stick to it until the end to put up a name for the Reserve, so they can say that they have one of their boys over here. I could have got out of it when the other boys got their discharge only I wanted to do my bit like all other Canadians. I knew that somebody had to go and fight for the Empire, and I made up my mind that I would go because it would be my duty sooner or later. Thank you to guest writer, Sydney Hampshire, for sharing her experience of documenting built heritage in Flagstaff County. Growing up in Northern Alberta kept myself, my siblings, and my parents a long way away from our extended family. We had only occasional visits with both sets of grandparents, which caused a disconnect between us. However, this disconnect also built a mystique around the lives of the past generation – and with it came an inherent curiosity. My grandmother, Joy Hampshire (nee Innes), was born, and lived all her life in Flagstaff County after her mother and father immigrated from Scotland. Flagstaff County harbours an abundance of built heritage structures that showcase the region’s rich past. As a child, I was exposed to this heritage on each trip we took to our grandparents and I remember becoming terribly intrigued by this built heritage and the relics of my grandmother’s past. I remember each visit to Grandma’s farm required a visit or two to nearby abandoned homesteads. Each trek into a forgotten house, shed, or barn brought me great excitement: What would I find? What would I see? What would I infer about the people that used to live there? October is Canadian Library Month – a time to raise awareness about the valuable role of libraries in our communities. Thank you to guest writer, Erin Hoar, for this post about some of Alberta’s first libraries. The earliest libraries in Canada were generally private collections of books and documents brought over by European immigrants. Some religious orders, fur trade and military posts would also collect books, but these were generally not accessible to the wider public. Canada’s earliest public libraries were offered by subscription only and began to appear in the early nineteenth century. By 1900 the modern public library, similar to what we would think of as a library today, began to acquire, classify and organize books, periodicals and newspapers with the purpose of providing users with access to these collections. The idea of libraries was becoming more recognized as a public need that enriched growing communities, as was the case in Alberta. Many of Alberta’s early libraries were established because there were dedicated people who were passionate about providing accessible learning and educational services. This post will trace Alberta’s earliest public libraries in Edmonton and Calgary, and look at the people who brought these spaces to life to become valued and trusted resources for their communities. Read on to find out more! 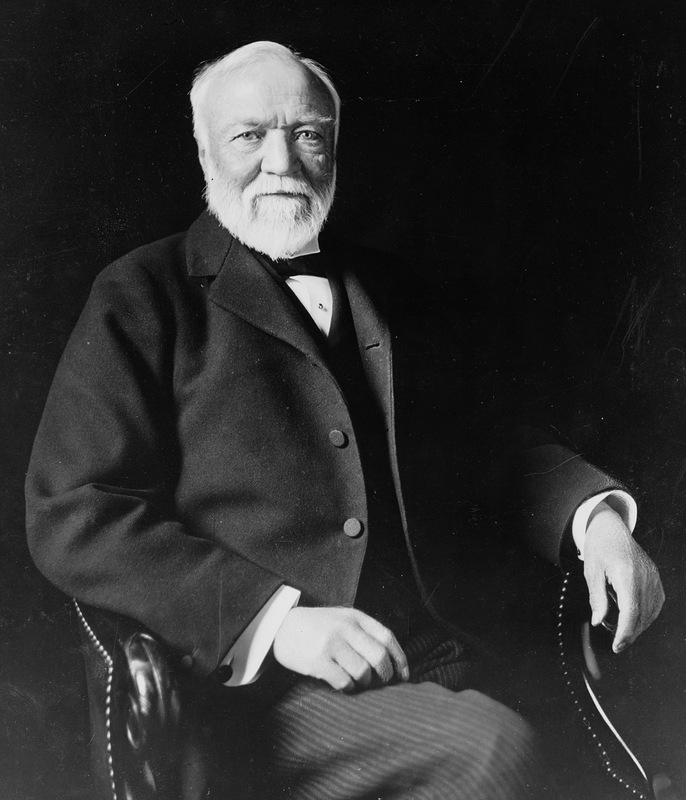 Andrew Carnegie, 1913 (Public domain).